This book is concerned with the evolution of special education policy and practice. It assesses what has been accomplished in the field over the past several decades, what remains to be done, and what must be reconsidered. 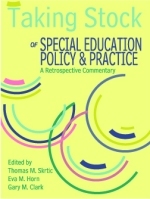 Its retrospective approach allows noted authors in several areas of special education policy and practice to reflect on their previously published works, discussing the context and motivation of their writing and relating their ideas, intentions, and recommendations to present-day needs. The book is organized into seven areas of special education scholarship. Thematically, readers are introduced to a conceptual framework for integrating the broad range of perspectives in the book and to a principled stance for the field of special education whose strength lies in its diversity of interests. The primary audience for this volume will be professionals in special education, curriculum, disability studies, research design, and policy studies. 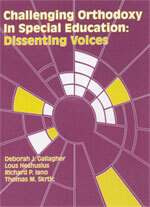 This content is a response to Challenging Orthodoxy in Special Education: Dissenting Voices edited by Deborah Gallagher (published by Love Publishing). All graduate students and graduate faculty should own this book. This text intervenes in the debate between postmodern theory and the Enlightenment thinking it challenges currently raging across academic disciplines. 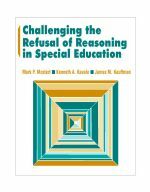 It responds directly to the call for a postmodern approach to special education in the Gallagher book with an impassioned defense of the precepts of science against the threats of relativism. This book marshals a series of essays to argue that the liberatory approach to special education is a clear danger to the children it is intended to serve. It refutes the call for a total rejection of the scientific methods and the more subtle ways postmodern thinking undermines science by preferring moral imperatives to objective facts. The editors of this new book employ the well-designed studies they defend to prove instances of specific harm from the faulty teaching methods postmodernists promote. 1. Orthodoxy and Dissent I: An Introductory Response to Gallagher et al. This book discusses some of the core philosophical concepts in special education and provides an in-depth look at future possibilities. Will the field function much as it does today or make coherent changes? How will the heated debates about full inclusion, labeling, and definitions of disabilities play out? How will the research on instructional practices and teacher preparation generate changes? This text will be of considerable interest to professionals and students in special education, disability studies, educational administration, curriculum, and policy studies. The expert authors offer perspectives on the problems facing special education and some of the possible solutions. They bring together the latest thinking in the philosophy of science, sociology, disability studies, and disciplines outside of special education. The intended audience for this book includes graduate students and teacher educators involved with graduate seminars centered on critical issues in education.